PHOTO: (Left) Order up: The cheerful barstaff serves classic French and American cocktails, along with a list of draft drinks; (Right) A Colorful Palate: Felix’s small plates—which include (clockwise from top left) a burger with classic frites, lobster deviled eggs, and brown-butter gnochi topped with chicken confit and charred Brussels sprouts—are meant to be shared. *NOTE: This review describes the Felix Cafe et Cuisine kitchen staff and menus as they were at press time. Since publication, chef Elizabeth Schultenover is no longer with Felix. As the sounds of the city segue into the beat of Spoleto Festival USA’s 42nd season, Upper King’s contribution to the recent surge of French dining, Felix Cocktails et Cuisine, beckons. During the international festival of music, theater, and dance in Charleston, the restaurant displays its own culinary artistry. Owners Felix Landrum and his wife, Leslie, relocated to the Holy City from Ann Arbor, Michigan, where Felix operated Cafe Felix for two decades. He engaged Nathan Thurston of Thurston Southern to assist in crafting a Parisian-inspired menu for the Charleston space and recruited Elizabeth Schultenover as executive chef. A Johnson and Wales graduate, Schultenover honed her skills at Asheville’s Table and Cucina 24, both eateries committed to local, seasonal, and authentic expressions of modern cooking aesthetics. Skilled bartenders complete the team, mastering wine bar conviviality and cocktail creativity in the amiable way of the French. PHOTO: (Left to right) Globally Gifted: Chef Elizabeth Schultenover spins Southern ingredients into artful, French-inspired dishes; Rendezvous Spot: Surrounded by an airy, white-and-blue color scheme that subtly nods to the French flag, guests take their seats at the handsome bar and high-top community tables. Felix embraces diners with a portal to Paris, happily located in Upper King Street’s Midtown development. The restaurant is classic and comforting, exuding all the requisite details of a bistro, brasserie, and bar. Subway tiles, Art Deco posters, low-slung tables, caramel-colored tufted banquettes, and a crystal chandelier illuminating a coveted corner booth bring an A-game of design and charm. Light bounces through this diminutive space, providing a cinematic glow to both the room and its patrons. Timeless Palladian mirrors outfit the back wall, reflecting the muted glow from the pendant lighting above and flickering candles in mercury glass votives below. The patina of age is yet to come; but it is assured, as this neighborhood boite provides evening delights with promises of lunch and brunch on the horizon. Built for casual, frequent visits, Felix’s menu of French-style small plates made with Southern ingredients and well-priced drinks sold by both the glass and carafe does not disappoint. The workhorses of a bistro’s menu are present: soupe a l’oignon, steak frites, croque monsieur, salade verte, and specialties du jour. Schultenover’s kitchen is without gimmicks, and she tailors her menu to align with the bar program and paired wines for dining satisfaction. 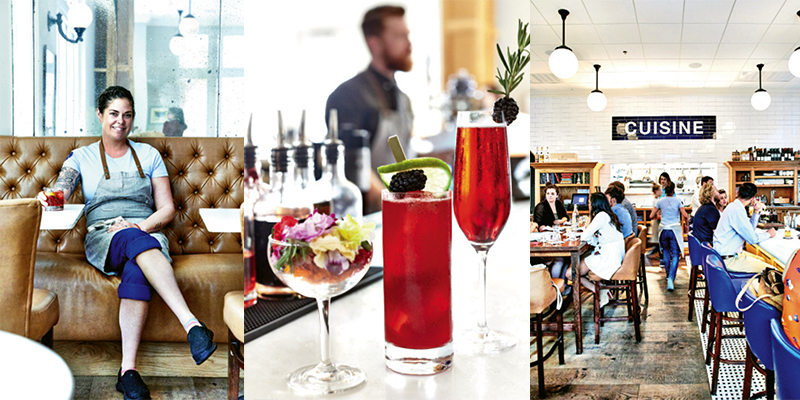 The curated cocktail menu, saluting French classics and exploring modern riffs in the spirits landscape, assures success at the bar. Petit plats set the stage for portion and presentation, and the offerings encourage sharing. A sturdy tryst of charcuterie and fromage finds expression in torsades, puff pastry twists of ham and cheese that are served with creamy Mornay dipping sauce. The crunchy, indulgent bites pair perfectly with a glass of Rose de Printemps or Cordeuil Champagne. Seafood seems de rigueur in the Holy City, and Felix’s answer is lobster deviled eggs and crab croquettes with cheeky hints of celery and okra adding crunch—each right-sized for sharing or individual indulgence. PHOTO: (Left to right) Golden Hour: Come cocktail hour, diners unwind in Felix’s classic yet comfortable leather booths (above center). 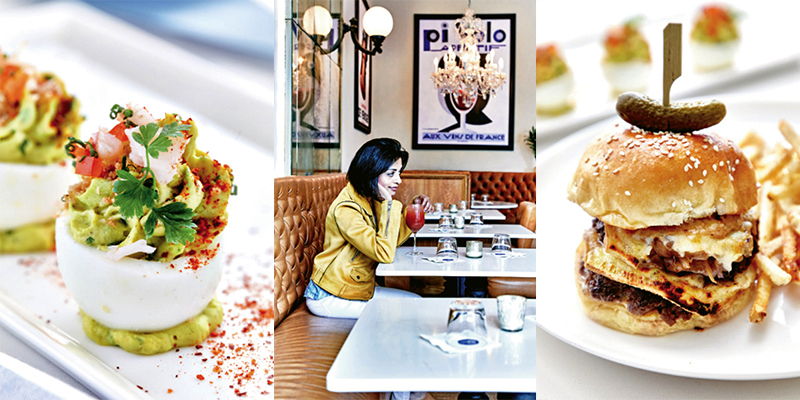 The restaurant’s dinner and drink menus offer deviled eggs filled with lobster, mustard, and spices (above left); a spin on the classic bistro burger with raclette cheese and frites (above right). Another starter to split, fromage fort (the French take on cheese dip) is topped with paper-thin wisps of radish wheels and served with toasted baguette slices. The cheesy richness takes the edge off your hunger and pairs well with the restaurant’s mostly local beer list. Quintessential onion soup easily complements the salad options, and tarte flambée—a savory mushroom pie layered with caramelized onions, guillotined potato slices, chevre, and arugula—is a substantial first course or pastry for the table. Though the menu is styled with classics, the kitchen gently teases preparations. The Brasstown grass-fed beef burger is composed of two thin patties layered with onions and raclette cheese. The juicy dish arrives teetering on a sesame bun speared with a tart cornichon to anchor it to the plate. The steak frites small plate comes slightly over-salted with a knob of welcome beurre rouge and a crown of “delicate local greens,” though the eager use of microgreens is unwarranted, as they have neither the sturdiness nor the flavor profile to balance or lighten the dish. Do try the gnocchi a la grand-mère (known as “gnocchi Parisienne”) made from pâte à choux (the pastry of éclairs, cream puffs, and profiteroles) and topped with a confit of chicken, charred Brussels sprouts, fines herbes, brown butter, and chestnut honey. A dish made for all seasons, it would be excellent tossed in the spring perhaps with herbs, morels, and peas; or in the summer with corn, tomatoes, and zucchini. Pan-seared poisson du jour is a keeper as well. The fillet (snapper, wreckfish, and grouper have all been featured) is served in a lush saffron broth, dappled with local yogurt medallions, smoked olive oil, piperade, and za’atar. The cooking was accomplished, the flavors revelatory. Desserts are aligned with the bar motif, and here the menu eschews France, save for the boozy additions of Cognac and Calvados. The former flavors a vanilla milkshake finished with Port-infused whipped cream; the latter is added to an apple trifle layered with warm, crunchy brown butter cake and Kelly Chu’s Cirsea cinnamon-cayenne ice cream. Both treats, paired with a dessert cocktail, are worthy of a late-night visit. Felix takes its name from its owner: a moniker rooted in the Latin term that means “lucky, successful”—there is no finer epithet for a restaurateur. Intersecting between luck and success is the passion of the restaurant’s staff. Well-versed in the menu and schooled on the ingredients, they amplify warmth and inclusion, celebrating modern French cuisine and culture effortlessly.